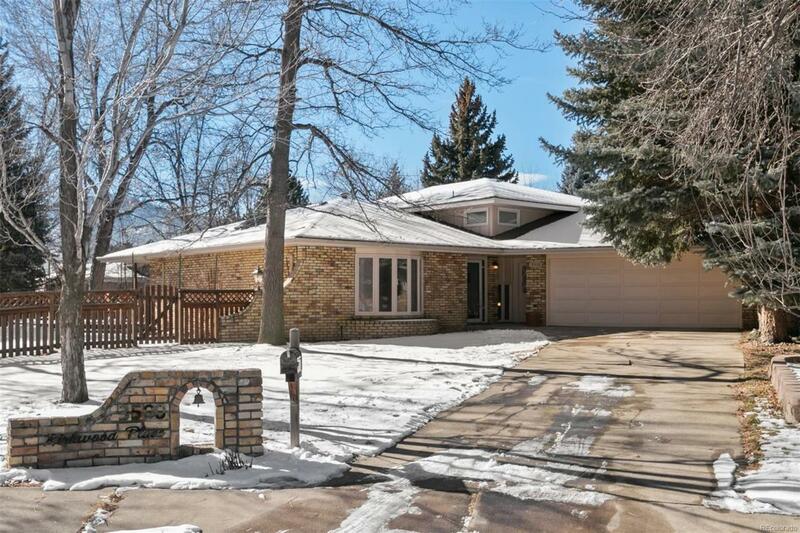 Welcome to a fantastic opportunity to own in sought-after Kirkwood Pl nestled in spacious cul-de-sac in heart of Boulder on a .33 acre lot! Desireable floorplan; Large open spaces with abundant light; Views of Flatirons/Foothills from master bedrm; Renovated: 3 baths, study, laundry with custom cherry cabinets & granite & fixtures, plumbing; New SS appliances: refrig/freezer, quiet dishwasher; 2 ovens, gas cooktop; New Roof; New hot water tank and furnace; Wine cellar w/air cooler in unfinishe.d basemt; Central vac; Heated garage; Water rights keeps yard green w/o paying city water; 800 sq ft Brazilian Redwd deck; Mature trees; Privacy; Near: 3-6 million dollar homes, cafes, local fd markets, Pearl St; Boulder is known for easy access to bike paths & parks. You'll love this home & neighborhd. Move-in ready, add own decor touches; See Features pg attached. Move-in ready or presents exciting opportunity to expand on a rare .33 acre lot and additional potential mtn views with expansion.